The University of Wisconsin tested the effectiveness of BugVibes™ – Japanese Beetle Kit and the analysis was completed as of September 6th. 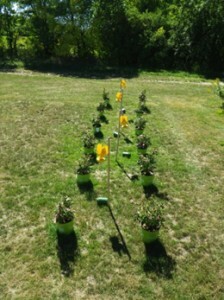 Tests were conducted using six plants without BugVibes™ and six plants with BugVibes™. *The University of Wisconsin offers an MS and Ph.D. degree and their Entomology program is ranked in the top 5 nationally – Japanese beetles are a specialty to the university due to the predominance of the species in this location. 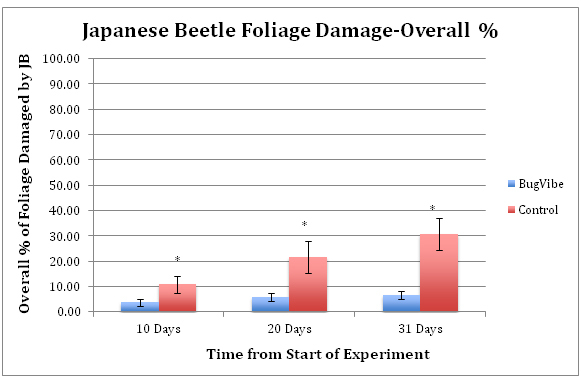 The results of the stringent testing demonstrated BugVibe’s™ availability to prevent damage done from Japanese Beetles. The results were based off of three qualifications; count of damage on leaves, percentage of overall of feeding damage to the rose plants, and percentage of flowers fed on by Japanese beetle adults. After comparing the rose plants with the BugVibes™ units to the control plants, the first part of the tests concludes that BugVibes™ units can effectively reduce the incidence of feeding on foliage by Japanese beetle adults. See figure below to see the Japanese beetle foliage damage-leaf count. 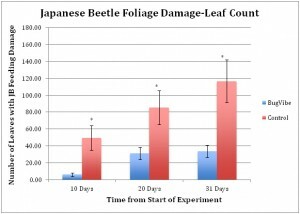 Part two of the study shows that the BugVibes™ – Japanese Beetle Kit reduced the overall damage to the rose plants by a very large amount. See figure below. Previous story UW-Madison Reports – BugVibes™ Successful at Control of Japanese Beetles!